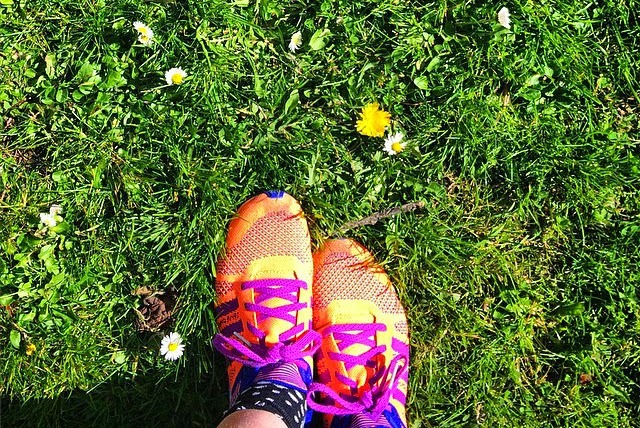 It's been seven weeks since I nervously laced up my trainers and headed out for my first run in a very, very long time. It took me over an hour to psyche myself up enough to actually leave the house. I couldn't find my headphones (and got in a massive flap about running in silence), I didn't know what route I should take, I had no idea how I was meant to carry my phone or keys without a bag or any gadgets, and I got really worried about how I would look, and what people would think of me. I was the world's wimpiest runner. But I'd signed up to do Race for Life. So I had to do it. (& I was part of Cancer Research UK's blogger team, which meant I really, really had to do it). So I did. I downloaded an app and started slowly plodding away... and seven weeks later I'm still running. I didn't die of embarrassment the first time I ran by a group of people, and my knees didn't explode from new exercise. I feel good about myself (and without really trying, I've lost almost half a stone). I also somehow seem to enjoy it now? I've changed. Here's what I've learned about running so far, which might help you if you are also the world's wimpiest runner. If I did not have the impending terror of my 10k race, I would not be running. I would be sleeping. And snacking. But I know if I do those things, then I will have a terrible time trying to drag my sorry self around the Race for Life course. Running now makes life in June so much easier (which you can also sponsor me for, if you are feeling kind!). I have only just started to like running (and even now, I'm still a bit unsure about the whole thing), so when I started I had to focus on what I did like. At first the ONLY thing I liked about running was when it ended, and I felt smug that I had done it. So I held onto that, and dragged myself out by thinking about how good it would be when it was over. After a while I realised that I also quite enjoyed being outside, running along lovely woodland paths, and looking at squirrels. But really, I mainly like feeling smug. There's no shame in that (I hope!). The idea of running for 30 minutes? Terrifying. The idea of running for a minute? Well, alriiiiiight. I downloaded a 10k runner app and I LOVE it. It tells you exactly when to walk or run, and leads you through the process in such baby steps that build your confidence, and avoid you burning out by trying to do too much too soon. Today I ran for 20 minutes in one go, which felt impossible seven weeks ago. Next month I have to run a 10k (oh god), which yes currently feels impossible, but I know that if I follow the app, I'll be fine. Apparently one of the most common problems with new runners is that you try to go too fast too soon and do yourself a damage. I did exactly this - in week two I was feeling alright with running a couple of minutes at a go, so I tried to go a bit faster. I ended up with mega achey knees (and then paranoia about KNEE PAIN), which made running even more miserable. So I slowed right now... and if I felt like I wanted to walk, I slowed to a walking pace, but kept jogging. And it totally helped! All of the advice says ignore speed, it'll come in time. I'm sure this won't be for everyone, but this totally changed my running experience. When I started I listened to really intense pop playlists, which were good for getting my energy levels up, but I also got really bored. I had started listening to podcasts after getting into Serial (like everyone else in the world), and as loads are about 30 minutes long, they seemed pretty perfect for my running sessions. And they're ace! I get totally caught up in the story, and focus on that more than the time I've got left to run. I've mainly been listening to This American Life and Freakonomics, but today I listened to Knifepoint Horror and had actual terror shivers as I ran (which is ace, because I didn't think about running!). This has been one of the best things. I genuinely felt a bit ill thinking about how the whole wide world would judge me, running along, pink face and out of breath. But then the minute I got outside, I suddenly didn't care. The first time I ran past a group of people, I realised that they didn't know if I'd been running for one minute or ten miles. The next time, I barely thought about it, and now I only focus on how to get by a group without breaking my pace (people with prams, try not to takeover the ENTIRE pavement!). I'd been nervous about seeing other runners too (because I wasn't a real runner, whatever that was), but they don't care! I think one or two people have smiled at me, but most of the time I ignore them, and they ignore me. I'm pink faced and I don't care at all about it. It's such a good self esteem boost. And overall, I just feel better. I have more energy. I have lost weight (without at all thinking about it). I adore having a reason to go outside on a sunny day on the spur of a moment, and I turn into the smuggest human when I run on a rainy day (and brag about it, sorry friends). It's still hard, and almost every run has a moment where I dream of sofas and doughnuts, but when I talk about it I'm genuinely happy. Which has really surprised me. So, I reckon if you've ever thought about it, or you're feeling a bit sluggish and want to change your routine up, start running. Definitely sign up for something if you're an exercise-slacker like me - Race for Life has over 300 events this year, from 5ks to marathons, so you'll definitely find something that suits your ability near you (plus you get discounted entry if you use the code RFLEver). And H&M have surprisingly cute running gear! Who knew? Hey Juliet! I'd love to connect with you :) First off, I'm a two-time childhood cancer survivor (almost 22 years cancer free!). Secondly, I'm a travel blogger moving to Edinburgh this September for a year while I attend business school :) So glad I ran across your blog last week. I'd love to get together with you at some point! Listening to podcasts is a great idea! I have a huge backlog of podcasts because I can never seem to find time to listen. I just started running again, (well, er, walking if we are being honest. Starting from scratch again over here). I am using the Gipis app on the recommendation of a friend. It sounds really similar to what you are using. I am definitely going to try the podcast tip.